Disney's Grand Californian: They Don't Call It "GRAND" for nothing! The Disney Grand Californian Hotel & Spa located in Anaheim, California is a luxe retreat into California’s past. In this review of the Grand Californian, From Toddler to Traveler offers us a tour of this beautiful resort so conveniently located near Disney California Adventure and Downtown Disney. From the moment your car pulls up under the portico at the newly-renovated Grand Californian, you feel yourself relax. The dark wood Craftsman style reminds you of long afternoons playing checkers in front of a fire with a glass of whiskey. Here at the Grand Californian, you can do just that. 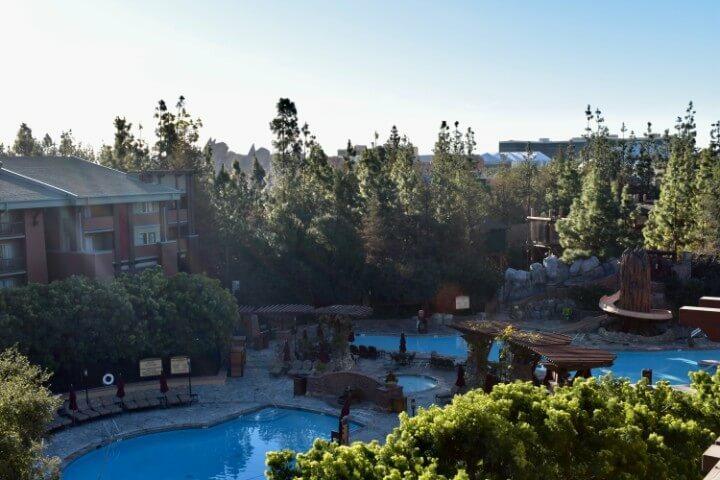 Located on the Disneyland property with one entrance into Downtown Disney and another directly into California Adventure park, the Grand Californian is ideally situated for a luxurious Disney vacation. All the restaurants of Downtown Disney are steps from the entrance to the hotel. Use our special link with ParkSavers to book a package and receive discounted Disneyland tickets or get this Exclusive Family Pack and Save $60 on 4-Day Park Hopper® tickets when you purchase 3 adult tickets. The monorail which runs between Downtown Disney to Tomorrowland is mere steps away from the entrance to the hotel. Amenities and restaurants are centrally located within the resort, but the rooms are spread far and wide. All roads, though, lead to the elegant Craftsman lobby. We stayed in a Woods-Court View single room, which looked directly onto the tree-filled courtyard where the monorail ran. Rooms here start around $420 and increase depending on the view. In retrospect, I may have sprung for a premium view room which overlooks either the pool or the theme park, as you could perhaps watch the nighttime light shows from the comfort of your room. These rooms do tend to be further from the registration desk. 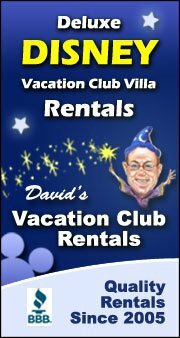 To save on rates consider renting DVC points from David’s DVC. You can read more about that in our post on staying on property at WDW. The Grand Californian has several room types including 1-3 bedroom suites and a club level. They even have signature suites which could sleep up to 12 adults. Club Level service, as at many hotels, includes a continental breakfast, wine and cheese reception, afternoon tea, personal concierge, and access to the Verandah, where you could watch the fireworks from the balcony. All rooms have a mini refrigerator, small closet, bathroom with a shower, laundry basket, step stool for the kiddos to reach the sink, and free WiFi. The theming here is quite subtle. You may find Chip and Dale hiding in the trees on the walls, but otherwise think beige and redwood. Beds were very comfortable, and the housekeepers come by in the evenings for turndown service along with Ghirardelli chocolates. They do have 2 very cozy robes in the room for you to use if you so choose. Storyteller’s Café character breakfast and brunch featuring woodland creatures and Chip and Dale, as well as mimosas. We also enjoyed room service which is wonderful, if you have a soft spot for Mickey waffles in your pajamas and robe. They forgot one item we had ordered, so they sent it up free of charge within 20 minutes. The Hearthstone Lounge serves as a coffee bar in the morning and cocktail lounge in the evening. 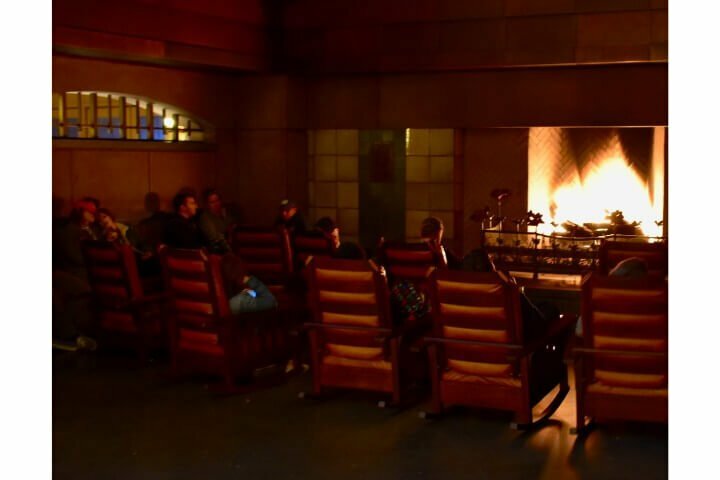 Food and beverages can also be enjoyed in front of the spacious lobby fireplace. Since Downtown Disney is so close, we did notice several guests bringing in take out from the nearby restaurants, or would bring a pizza from White Water Snacks to the room. Bottles of wine could be purchased at the onsite gift shop, Acorns Gifts &Goods, and beer was available at White Water Snacks. As they say on their website, “it’s a place where science and nature dance together in perfect harmony.” They have destination-themed spa services, such as “New World” or “Asian” Journey. After a long day at the park, a relaxing luxurious massage for tired muscles sounds like an excellent idea. It is California, after all, where the sun always shines. 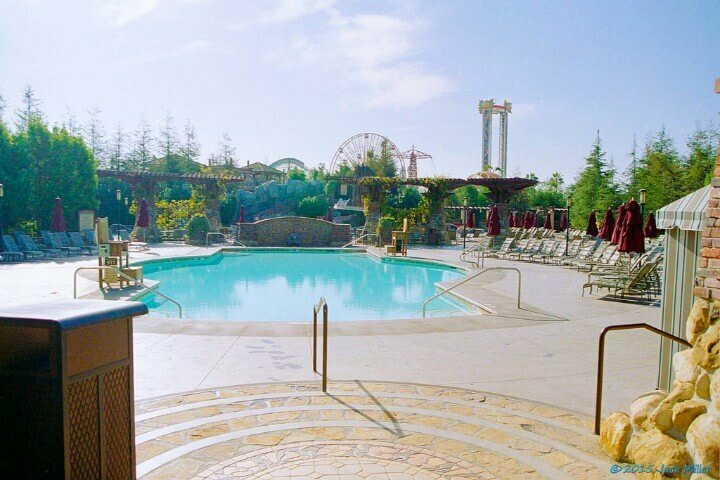 The Grand Californian boasts 3 recently-renovated pools with a redwood theme. Of course, during the weekend we visited, the temperature never rose above 60 degrees, so we did not try the pool facilities, but they looked beautiful. The redwood waterslide looked like a lot of fun. They also have a turtle-shaped fountain to complement the Fountain Pool, and a circular Mariposa Pool. Every evening at one of the Disneyland resorts, they screen a Disney movie for free. Details are available at check in and at the concierge desk. Bring popcorn. Throughout the day and into the evening, you could hear live piano music that resonated in the rafters. Discusses the Craftsman movement and its influence on the hotel. Ask at the Guest Services desk for information on any of these. Free to all guests of a Disneyland resort property is also the early morning (like 600 AM) Get Up and Go walk. Strollers are not allowed, as you are expected to maintain at least a 15 minute mile. On the upside, though, you get to walk through California Adventure before it opens. That may encourage me to wake up early. The real reason to stay at the Grand Californian is to enjoy the direct access to Disney’s California Adventure. You go through security at the private entrance beside Napa Rose, then scan your ticket, and boom. You’re there right in the shady woodland across from Grizzly River Rapids. Besides the special entrance, as a guest of a Disneyland resort, you can enter one of the parks for one early Extra Magic Hour. The lines for this are actually shorter at the main entrance to the parks vs the secret entrance or taking the Monorail. You’ll notice if the line is too long to wait if you’re grabbing breakfast at White Water Snacks. As it is centrally located, once you’ve paid to park overnight at the Grand Californian, you really may not need your car again. It is very close to the Downtown Disney monorail entrance, and about a 5 minute walk to the main park entrances. None of the other Disneyland resorts are too far away, either, so it’s quite easy to visit Disneyland Hotel or Paradise Pier for either of their character breakfasts or a movie night. With its signature Disney service, elegant old-California comfort and plethora of unique amenities, the Grand Californian lives up to its luxurious title. If you can spring for the views of Downtown Disney or California Adventure, you may be able to see fireworks from your room. The location. You really can get everywhere within just a few minutes, and it’s a comfortable place to retreat for a midday nap. The entrance to California Adventure. I love California Adventure, and when Pixar Pier opens, I think everyone else will love it, too. Now it’s even easier to access it. On a side note, even if you aren’t staying at the hotel, you can still use the California Adventure entrance to eat at White Water Snacks. It’s much quieter than a lot of the park counter-service restaurants, and the chefs are often amenable to accommodating your tastes (a.k.a secret menu). The Disney service and the movie nights. The outdoor views from the balconies. The Craftsman theme is a little…intellectual. My 3-year-old did not get it, though honestly she did not care once Mickey waffles got involved. No kids club. Not that my kid will go to one, but if you wanted a nice evening out sans children at Napa Rose, you need to speak to Guest Services about hiring a babysitter. Overall, this really is a beautiful resort with a lot of special Disney touches that will make your vacation memorable. For a comparison of what we at VeraVise WOW Travel thought of Disneyland vs. Walt Disney World check out this post. Thinking about a Disney Cruise? Read our Tips For A Disney Cruise here. Read more Disney Resort Reviews here. I have walked through and dined at this resort numerous times but will actually be staying here for the first time next week!